Beneath one idyllic meadow field in rural Hamburg, Germany, a slumbering city hides. Its walls barely peek up above the surface of the soil; after dark, gentle light wafts up from the subterranean metropolis. Giant people as tall as any skyscraper walk about between the buildings, laughing and staring in awe at the quiet little city. 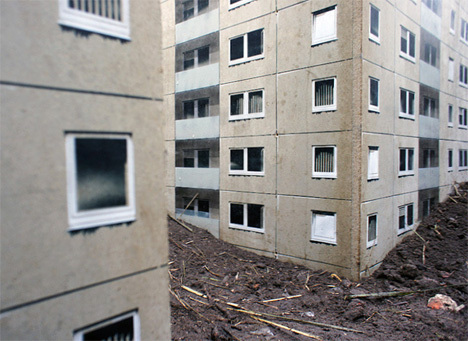 The city is an on-site art installation by EVOL, the Berlin-based artist best known for transforming rectangular urban objects into miniature buildings. 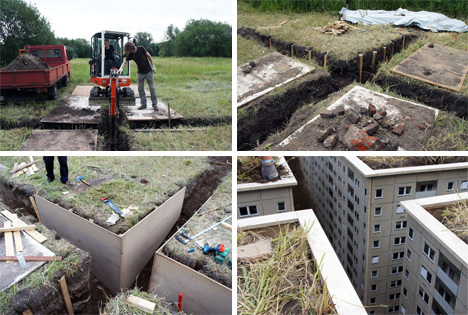 This time, instead of using existing structures to construct imaginary residences and businesses, the artist cut into the landscape to create a fantasy land beneath the surface of the Earth. The installation is quite small – only a few mini-city blocks worth of building facades – but the effect is large. 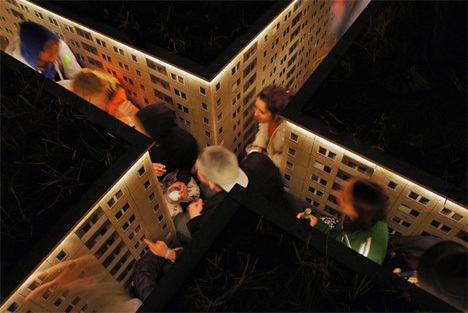 Visitors to the MS.Dockville arts and music festival, where the installation will be featured, are able to walk among the “streets” and delight in the fantastical feeling of being giants in a tiny city. In a way, it is easy to imagine a city like this actually existing one day. 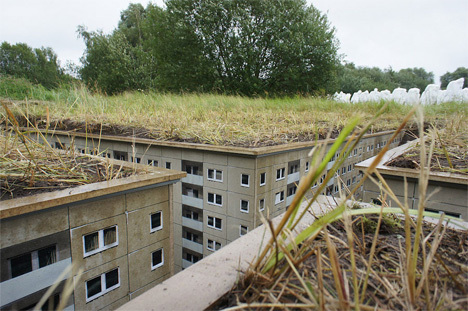 Our cities already feature numerous green roofs and rooftop gardens, after all. Building underground is already a proven way to take advantage of natural insulation, so cities like this may not remain firmly in the realm of fantasy forever. For now, this subterranean housing development consists of stencils and paper: EVOL’s materials of choice. 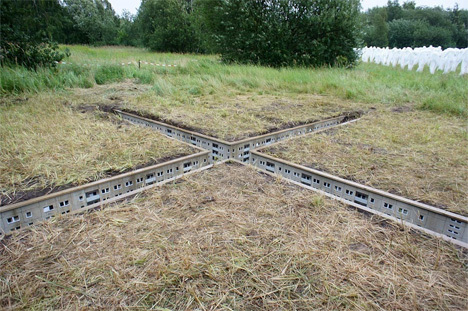 It is a temporary installation, so after the festival is over this strange little city will disappear forever, seemingly swallowed into the earth, never to be seen again.